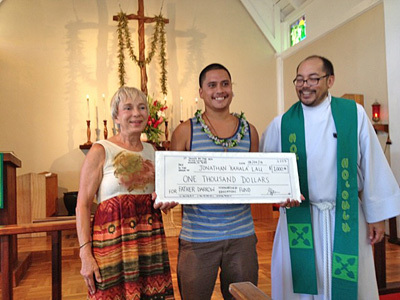 A "Tea Party" was held in Ho'okano Hall after the Eucharist on November 10th. Instead of focusing on pledging (because our congregation does a lot as it is), this event focused on wellness and appreciation, acknowledging our pledgers on a job well done! An array of teas (hot and iced) was served, along with biscuits, scones, muffins, small sandwiches, salads, etc. and those interested were pampered with mini chair massages as well as samples of beauty products as a gesture that their offerings haven't gone unnoticed! 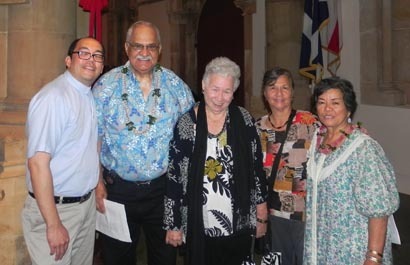 Sean Lau, St. John's treasurer, reflected on what our financial offerings have been able to do for our church over the past year as well as changes currently needed, reminding everyone that our help is essential to continue the legacy of St. John's By the Sea. Mahalo nui to Sean, Kahala, Tori, Akahi, and Jhonavi for all your work organizing and serving this marvelous occasion, to Phyllis for the beauty products, and to Sean and Rachel for the massages! Thanks also to Melody for the photos! 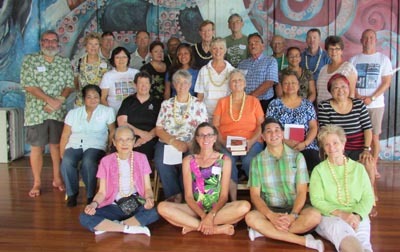 Rex and Renee Chong attended the Diocesan Stewardship Retreat at Camp Mokuleia this year on behalf of St. John's by-the-Sea. You can see them tucked into the group, standing just to left of center, in the photo below. Mahalo nui, Renee and Rex! St. John's-by-the-Sea Church members Moses E. and Naomi L.N.O. 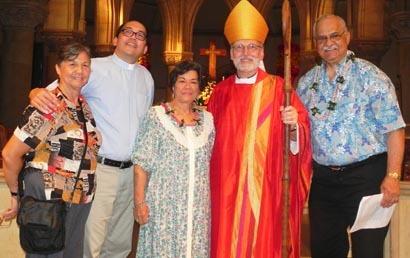 Kalauokalani were confirmed by Bishop Robert Fitzpatrick at St. Andrew's Cathedral on Sunday afternoon, May 5, 2013. Thanks to Melody Loyola for these photos of Moses and Naomi with the bishop, Rev. Leo Loyola, and other St. John's members Ipolani Johnson and Lois Murphy.